The Magic School Bus – Inside the Earth by Joanna Cole & Bruce Degen – We read another magic school bus book today called “Inside the Earth”. R’s favourite thing to do now while reading is closing the book and saying “the end”. This book, as is the case with all the Magic School Bus books, has tons and tons of information with added text features such as speech bubbles that make the book enjoyable for older kids. 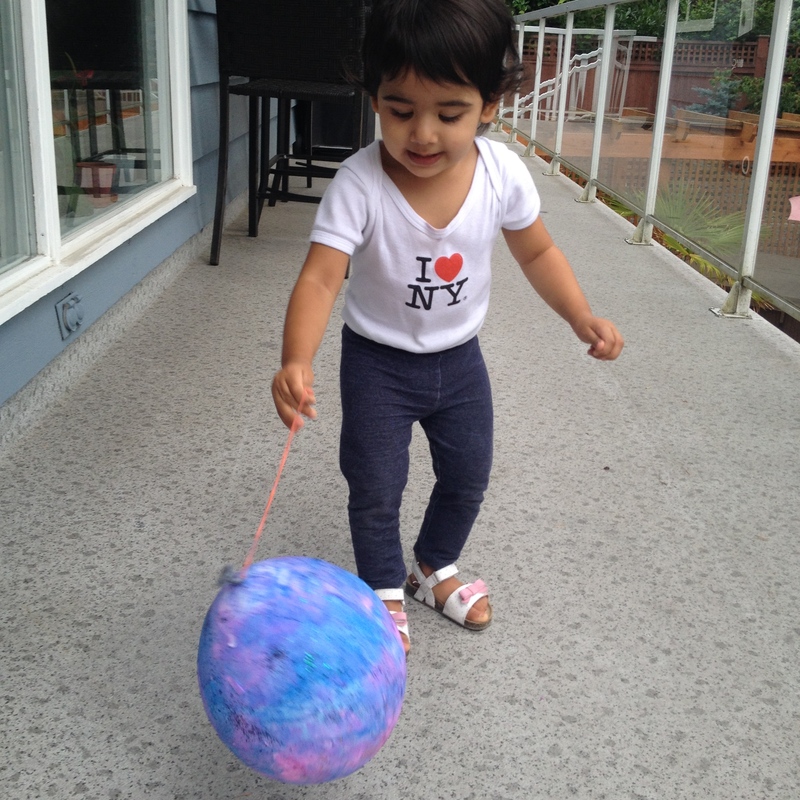 I attached an elastic to the paper mache planet we made yesterday and R practiced bouncing it! This is a fun and easy way to help kids develop hand-eye coordination and motor skills. To find out the details for making the paper mache planet, see the details here. 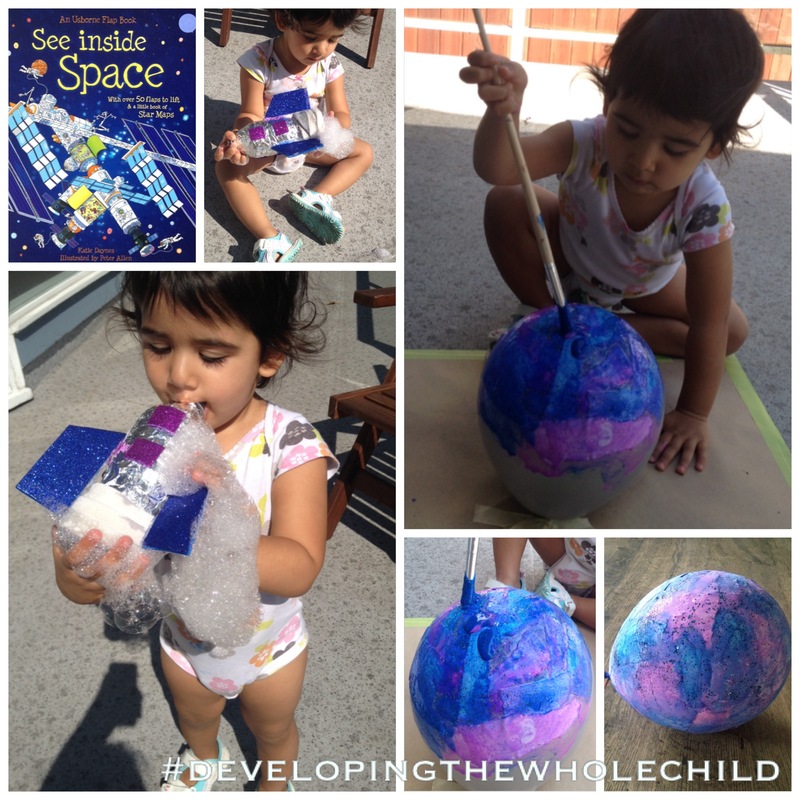 See Inside Space by Usborne – See Inside Space is another awesome Usborne Book!! Have I told you how much I love this series?! Well I do! :). R flipped some flaps, looked at pictures, repeated names of objects and then informed me that she was “all none” (all done), closed the book and trotted off! These books will be wonderful for R as she grows. The stunning photos and flaps engage her now and as she starts to read, the information will continue to engage her as she grows. 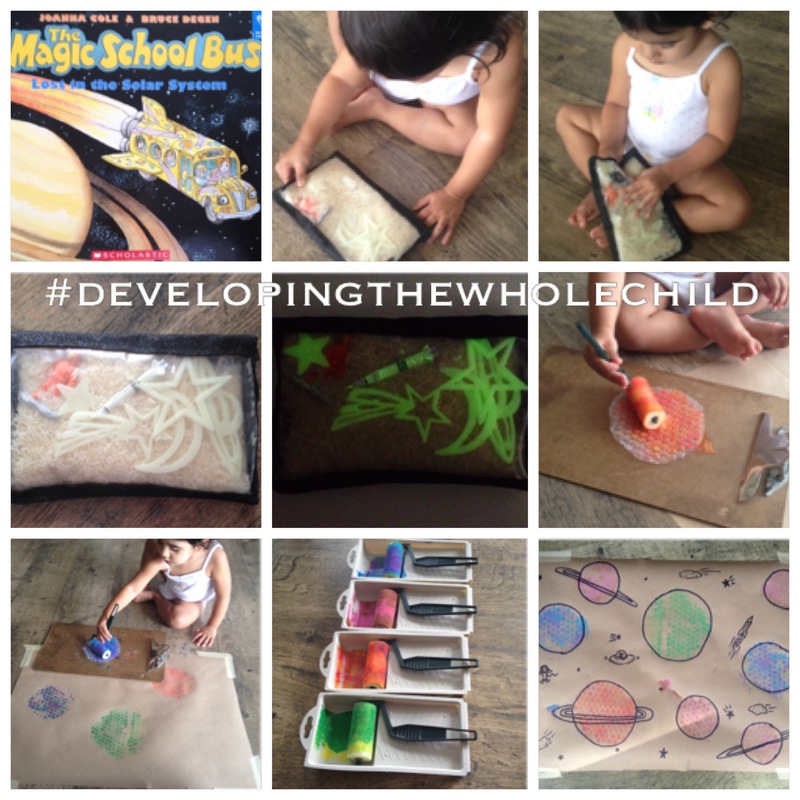 I had seen playdough2plato do this activity on Instagram and had to try it! It only took a quick demonstration to get R to understand how to make the bubbles come out since she has had practice with blowing in the past. The Magic School Bus – Lost in the Solar System by Joanna Cole & Bruce Degen – The length of this story was too much for R, but she enjoyed flipping through the pictures. This is a great book for older kids and was often a favourite choice for my kindergarten and grade one students. There are also lots of text features, such as thought bubbles and speech bubbles that are particularly enjoyable for older kids. The Moon by Melanie Chrismer – The Moon is a book that is part of a series of books about the solar system. R was not interested in me reading the book to her, so we just explored the pictures. Now and again, I read bits and pieces of the information on the page. I practiced a new poem with R called Zoom, Zoom, Zoom! I recited it while she played and she loved saying “moon” and “zoom” with me! She thoroughly enjoys songs and poems and loves to sing along, even if she doesn’t know the words. She will often scurry about and dance in circles while she sings. The Planets in Our Solar System by Franklyn M. Branley – The vibrant illustrations kept R engaged while I read this long book. 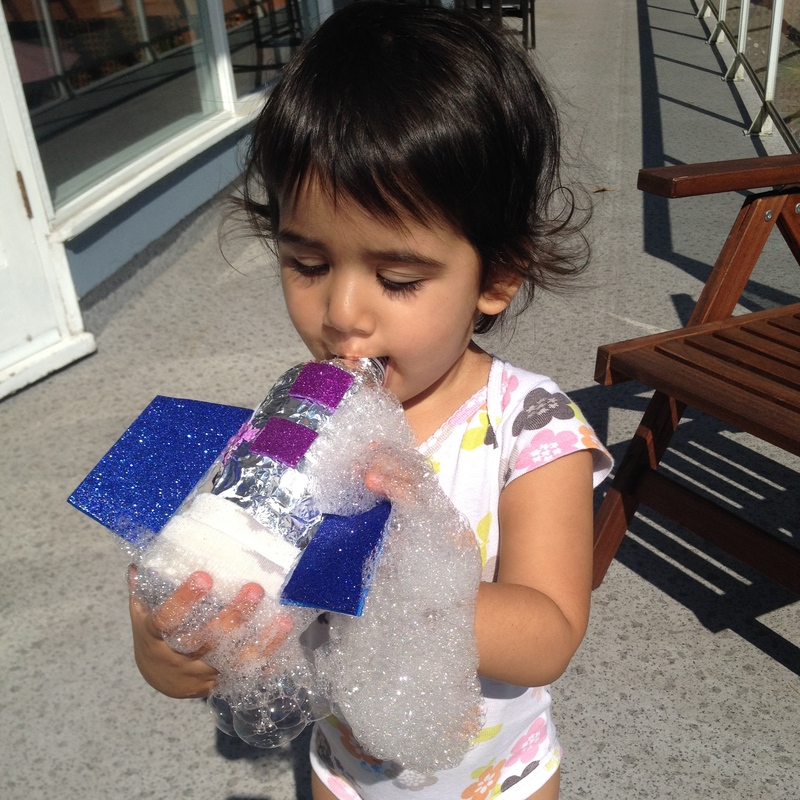 Along with the many facts about the solar system, there is a description of how to make a solar system mobile, a planetary distance activity and a variety of other activity ideas. R thought this activity was hilarious. 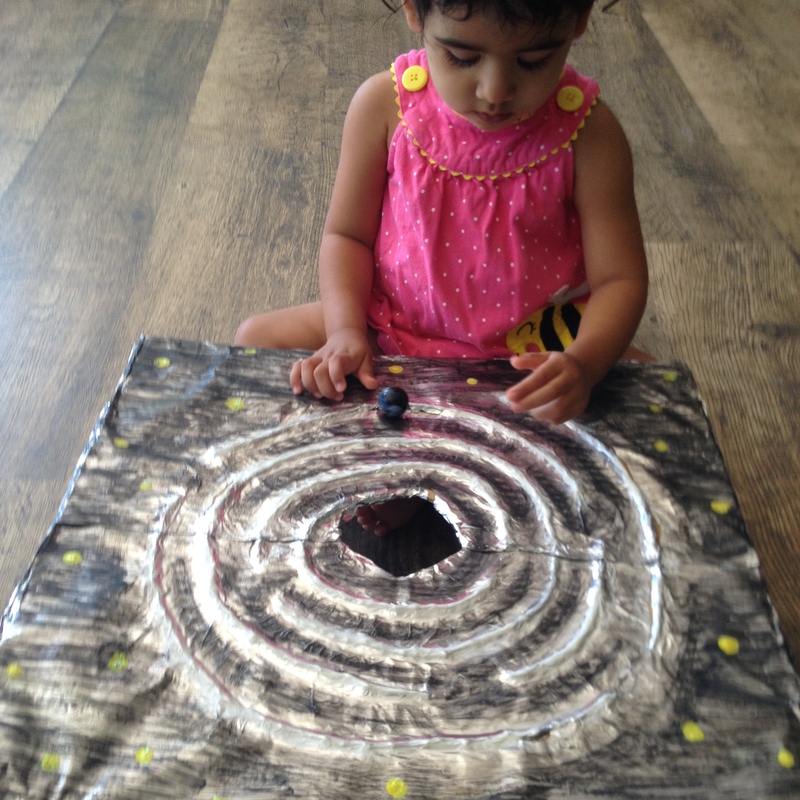 She enjoyed placing the marble down on the board and watching it roll around while shouting “wooo”. Sometimes she just dropped the marble into the centre and would look up at me with a mischievous grin. I kept the board up on both of our legs and showed R how to rock the board back and forth to make the marble move. 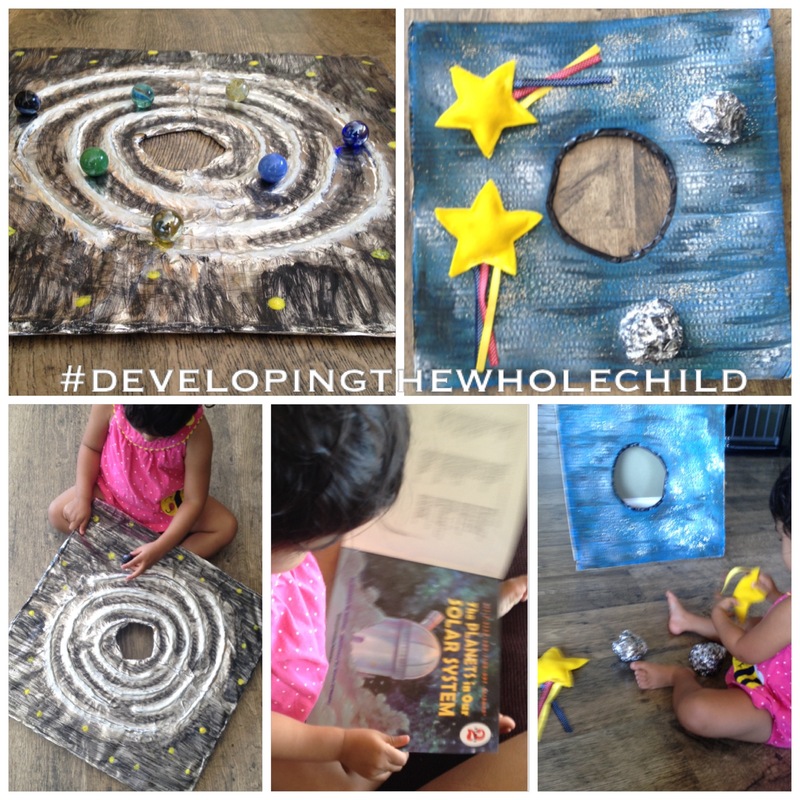 I made the marble run by putting circular hot glue lines onto cardboard and covering the entire surface with aluminum foil before painting it. I used my black and white paint dabbers to paint the surface and added yellow paint spots to represent stars. I cut a hole in the centre so that it could be the target for the marble run. 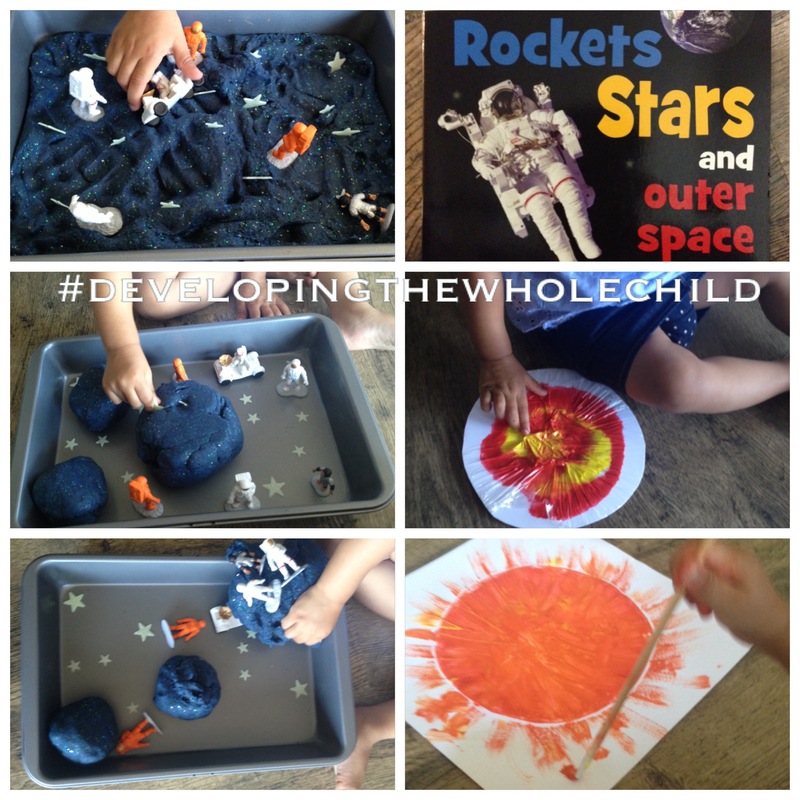 Mad About Rockets, Stars and Outer Space by Sarah Creese – Mad About Rockets, Stars and Outer Space is a fantastic nonfiction book about all things space. There are tons of facts, labelled diagrams, a search and find page and a clue and question page. You also get some bonus stickers with this book! 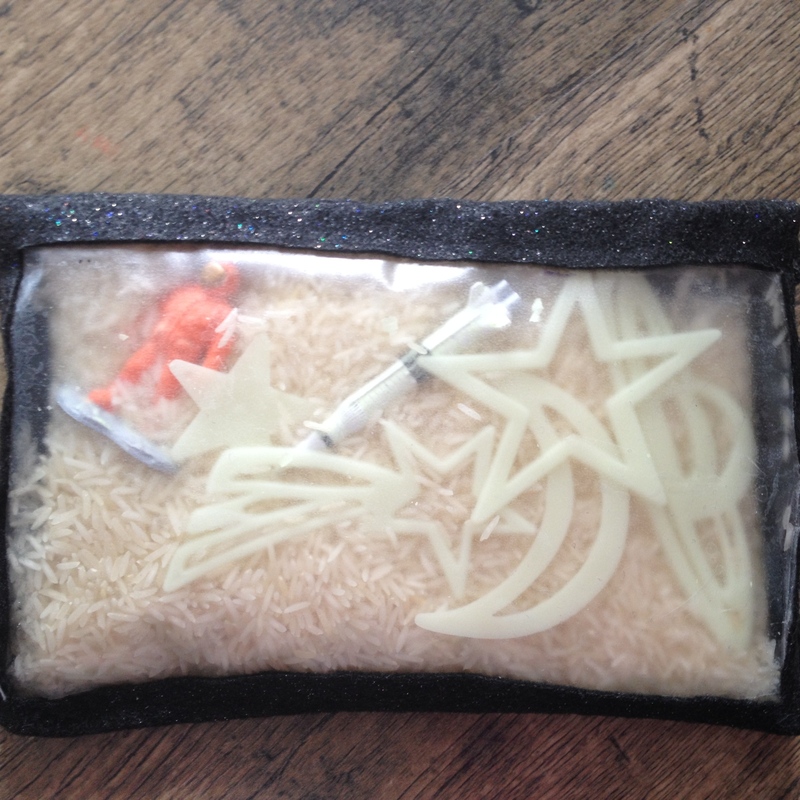 I cooked up some outer space play dough and added tons of course and fine glitter to it (to my husband’s dismay!) to give it the look of a star-filled galaxy. 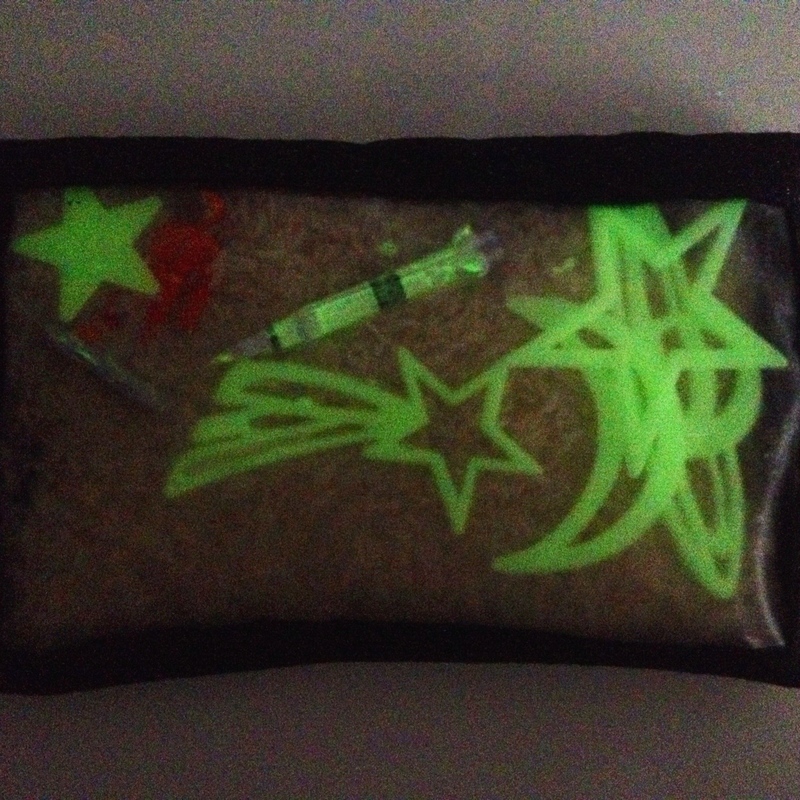 The glitter also adds a textured feel to the extremely soft play dough. 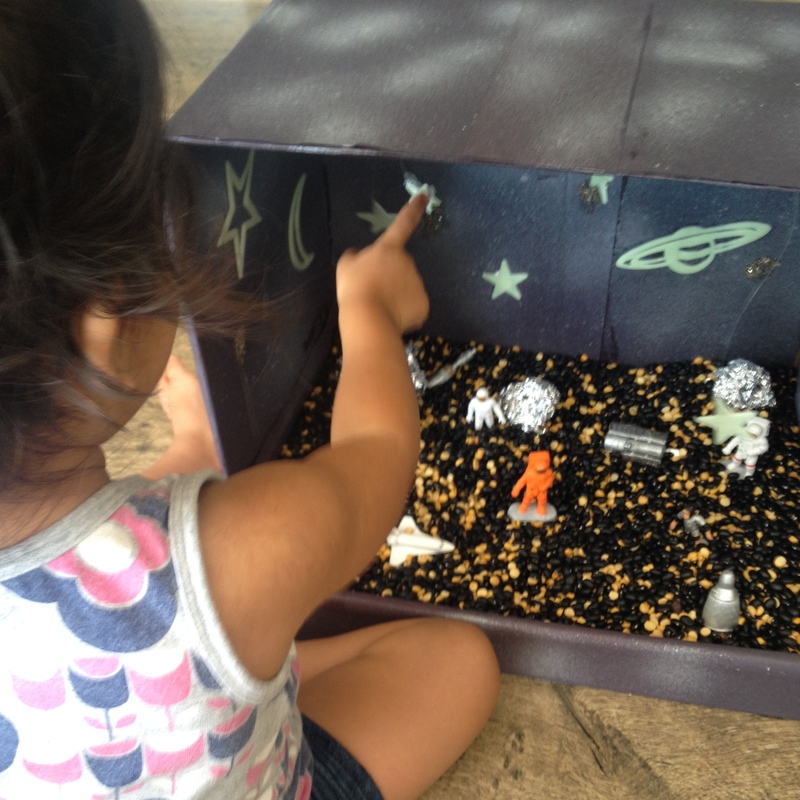 I invited R to enjoy this sensory activity by presenting the play dough in a metal cake tin with glow-in-the-dark stars and astronauts. To stimulate her senses further, I added vanilla to the dough. R had so much fun with this activity! During the play, we sang “Twinkle Twinkle Little Star” together and she joyfully played for an hour! To encourage language development, we practiced using the word star as R placed the starts into the dough. I pointed to and named each astronaut and R just listened as she is still unable to say this new vocabulary word. 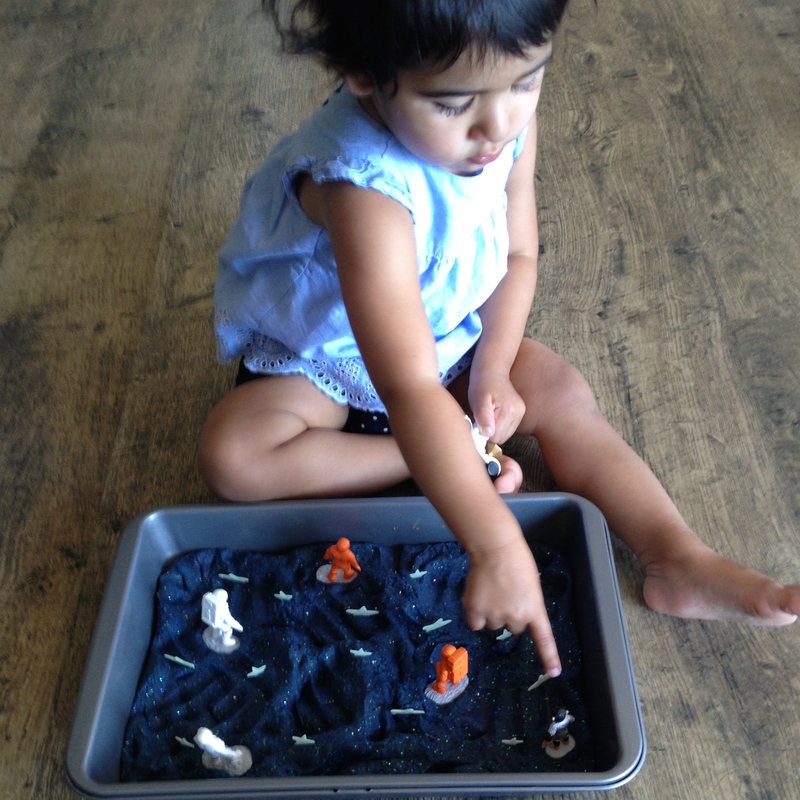 After the initial introduction to the play dough, I allowed her to play as she pleased with only a few interruptions from me that involved adding more language to her play.